In junior high, I was a serious night owl. I proudly taped the mantra “You Can Sleep When You’re 30” to my bedroom wall. Fast forward and, contrary to my adolescent foreboding, I am getting less sleep than ever before. When I was pregnant, people warned me I would never sleep again, but I brushed these harbingers aside. As it turns out, sleep deprivation is something no one can prepare you for until you experience it yourself. My beautiful, angelic son would transform into a tiny, bald, 14-pound dictator at the first sign of nightfall. He flatly refused to sleep anywhere but on me or my husband, so for the first few weeks we slept in shifts. I logged many a night with a baby on my chest, catching up on all 10 seasons of RuPaul’s Drag Race. As for naps, our petit prince would only doze in his stroller, so I pounded the pavement for hours each day; rain, shine, even once during a full-fledged ice storm. I couldn’t even rest at crosswalks, lest the slightest pause in motion rouse him from his precious slumber. I once woke up with my arm extended, pushing a phantom stroller in my dreams. A friend took one look at the bags under my eyes and suggested I hire a night nurse. I initially balked at the astronomical expense; who was I, Angelina Jolie? But after searching high and low for the TV remote one day only to find it in the refrigerator, I dipped into my savings and gave it a shot. Annette was with us for three nights, and during that time, she not only got my son to sleep in his bassinet, she also taught us a lot about baby care and routine. I was able to get seven hours of uninterrupted sleep a night and I felt like I could conquer the world. We were determined to keep up Annette’s routine, and were reluctant to even change the bassinet sheets lest her magic somehow be washed away. For about a week, things continued on track, but soon old habits crept in. Nursing or rocking him to sleep was so much easier than trying to get him to fall asleep on his own, and before we knew it he was back to his old sleepless ways. I tried to remind myself that this was only one aspect of my life; my son was otherwise happy and healthy. But perspective is a difficult thing to summon when you’re chronically sleep deprived. I became especially vulnerable to social-media comparison, resenting perfect, well-rested mommy bloggers. I grew insanely jealous of people whose babies slept through the night. I began obsessively researching baby sleep. I read countless books by the 3 a.m. light of my phone, learning more than I ever wanted to know about infant circadian rhythms. Some books advocated for letting your baby cry it out, while others suggested your child would never recover from the trauma. Certain experts extolled the virtues of co-sleeping, while others promised this was a surefire way to either a) kill your baby or b) ensure you would still be sleeping with them until university. Then there were the "miracle” sleep products. 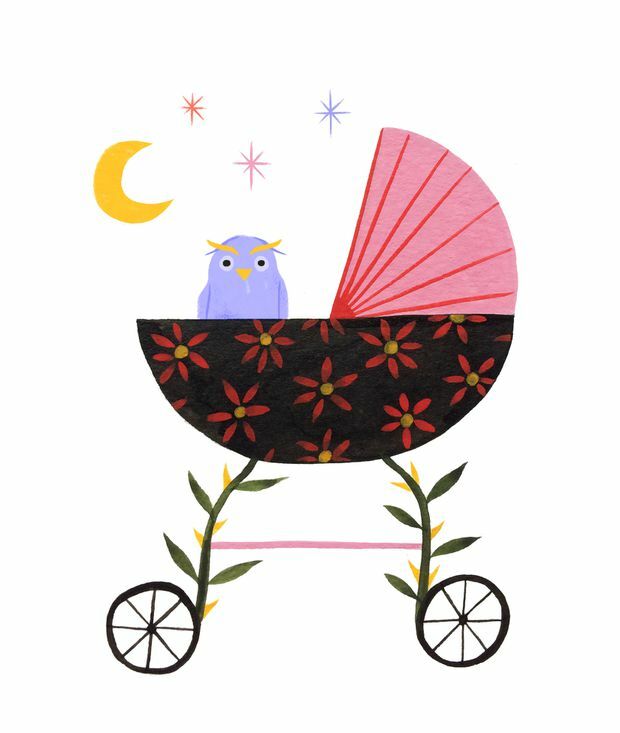 I succumbed to Facebook ads for white-noise machines, weighted swaddles, and countless other devices promising to “make your baby sleep 10+ hours a night!,” which ultimately only succeeded in taking up space in our storage room. At one point, I seriously contemplated buying a $1,400 robotic bassinet designed to recreate the womb, but then I remembered I had to eat. Alas, none of these genius hacks bore fruit. Bedtime was a multihour process of rocking, singing and shushing, where my husband and I would trade off in shifts like lines on a hockey team. When he finally dozed off, we would say a silent prayer and ninja roll out of the room. It was around this time that an update from my baby-tracking app read: "Now that your baby is sleeping through the night, you have no excuse not to get back into a regular exercise routine!” Exercise? I hadn’t had a solid stretch of sleep in months. Something had to give. Finally, we bit the bullet and hired a "sleep consultant.” A self-described infant-sleep specialist helped us put together an action plan to get our son sleeping, including detailed instructions for naps and bedtime. The plan focused on removing negative sleep associations (e.g., pacifiers, rocking and feeding to sleep) and teaching him independent sleep skills. Sleep-training methods that involve any amount of crying get a bad rap in the mommy community, but I was comforted by a number of recent studies that showed no evidence of short or long-term negative impacts on children. The crying, it seemed, would be tougher on the parents than it is on the child. The first night, I poured myself a glass of wine and prepared for the worst. I repeated positive affirmations to myself. I had predicted it would take several hours for him to fall asleep, but in the end it took 38 minutes. Listening to him cry seemed to go against every one of my biological instincts but I willed myself to stick with it. By the third night, the crying decreased drastically, followed by a solid seven-hour stretch of sleep. I was so happy I could cry. While our quality of life improved once my son could put himself to sleep, we’ve had a myriad of regressions. Three months later, I was beginning to think the concept of "sleeping through the night” is simply cruel, magical folklore. I’ve also tried countless times to get him on a nap schedule, but these attempts are sidelined by his incurable FOMO. My son now subsists on micro cat-naps while I sip double lattes and count the minutes until bedtime. So while our sleep journey is far from over, perhaps that’s symbolic of parenting. There is no finish line. There are no tidy victories. It’s an ultramarathon with peaks, valleys and no real end point. The goal is simply to achieve a pace that’s somewhat tolerable, and to try to enjoy the scenery along the way. Breann Kirincich lives in Toronto.